This is an old set. 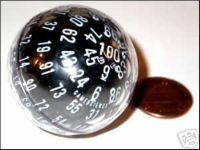 The 2011 dice are gray. 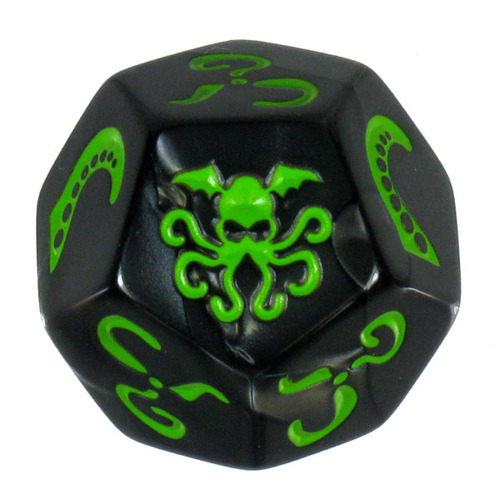 Every year when I go to GenCon or Origins, I try to get some interesting new dice. In 2011 I bought the GenCon polyhedral dice set for the first time ever. In truth, I have no use for polyhedrad dice, except that I use D20s for life counters when playing Magic the Gathering ™. But I must admit that they are intrinsically cool, and so I have some, and if I found a D7 lying in the street, I wold stop and pick it up. These dice come in many colors. I prefer the black ones, but I like them all. Note the nicely beveled corners for better rolling. Flying Buffalo has several other distinctive dice. Many of them are gimmicks, good for a laugh, and not much else. 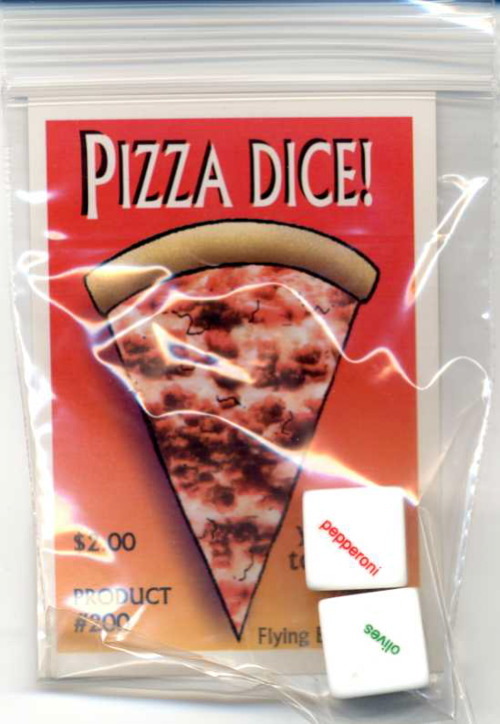 Examples include the Pizza Dice and Decision Dice. Can't decide what to put on your pizza? Let the dice decide for you--one roll per person involved. Need an impartial decision? Let the dice decide for you. Choices include oldest, youngest, alphabetical, owner, left, right. 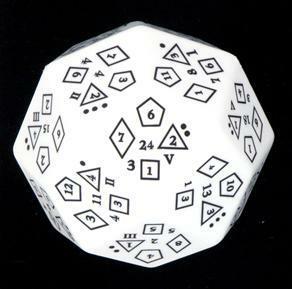 Game Science, a company founded by Lou Zocchi, is famous for their many strange dice. I saw some real beauties at their booth during Gencon. The one I just had to buy was this everything die. Each face has a value for all the regular solid dice. See if you can figure it out! 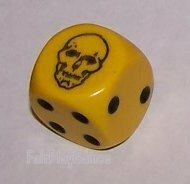 To use this die, you have to be enough of a dice geek to recognize the different faces. Do you see a D6, a D4, a D20 and a D12 here. D30 is in the center. Perhaps Zoccchi’s most famous die is the D100. The first time I saw one, I knew I had to have one. It is practically a ball, and you want to roll it in a box or something so that it won’t simply roll away from you and disappear into the far corners of the room. I have a white one. Don't think it was available yet in black when I bought mine from Lou Zocchi in person. 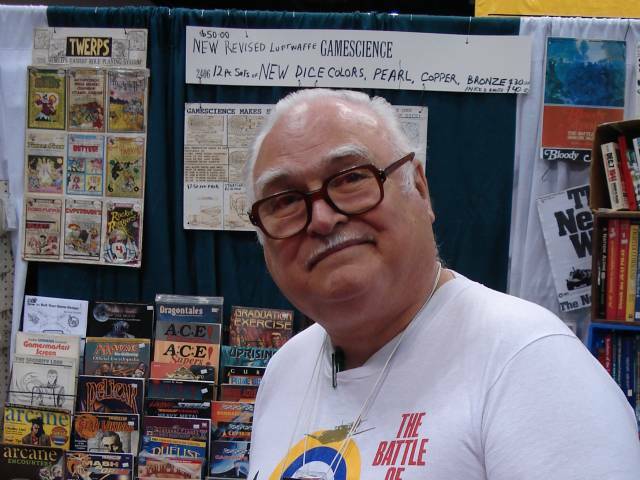 While I’m talking about Mr. Zocchi, let me put in my belief that this man is the single greatest expert on dice and the creation of dice in the 20th century, and maybe the 21st. 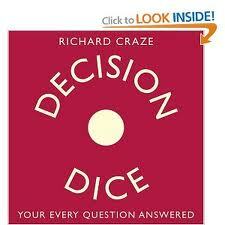 It is an education just to hear him talk about what it takes to create a D100 or D30 or everything die. Being an extremely lucky person, I have had these experiences. Lou Zocchi, wizard, hard at work selling dice and games at a convention. 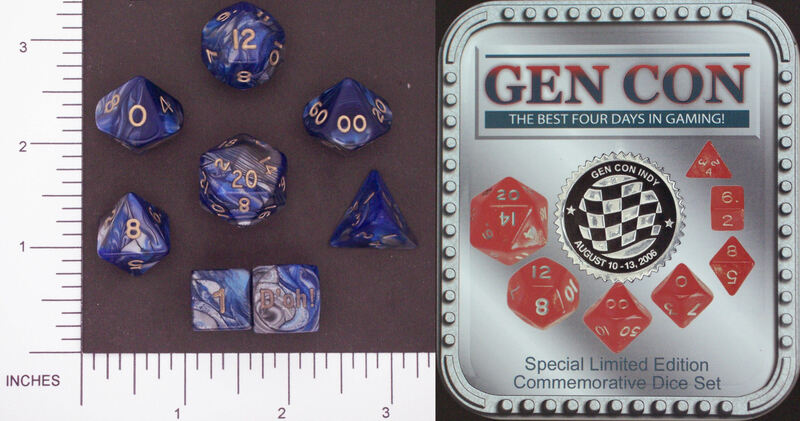 A big hit at GenCon were the so-called Iron Dice. 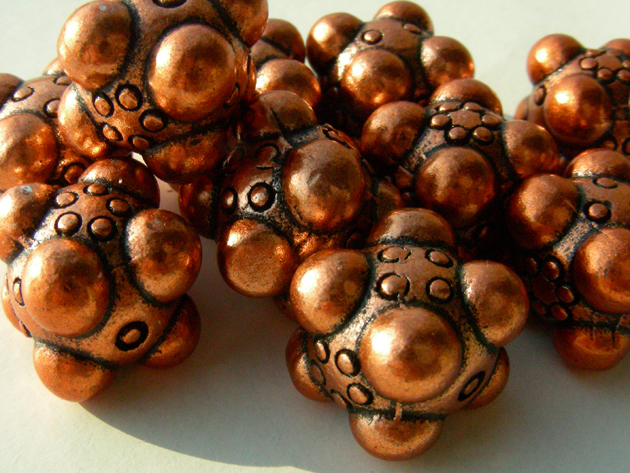 These were metallic dice in various colors–gold, silver, bronze, iron, coldsteel, etc. They were gorgeous to look at, heavy as hell, and cost a fortune. It was a minimum of $12 for a single die. I didn’t buy any. Don’t know what I would have done with them if I had, but they sure looked fine. Nobbly and heavy. Talk about dice weapons. If you got hit with one of these, it would really hurt. Dice aren’t just about numbers. Sometimes they are all about pictures or symbols. Steve Jackson Games is especially good at producing such monsterpieces. Madness! It's madness I tell you, and the tentacles don't help. Losing your sanity has never been quite this much fun before. And if gibbering mindlessly to the Elder Gods doesn’t turn you on, how about the neverending quest for brains. As food. 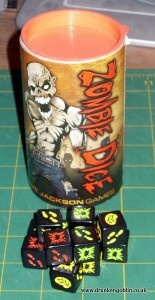 Yes, it’s zombie dice from the same lunatics that brought your Cthulhu dice and Flux. The first zombie to collect 13 brains wins, but watch out for the shotgun blasts. Well, I could go on, but by now you either see the fascination of dice collecting or you don’t. I like them. I have a lot of them. I’ve invented several little games that are really nothing but dice rolling. Tunnels and Trolls uses lots of dice, mostly because I like dice. If you like any of these dice, or have some pretty cool ones of your own, why not leave a comment about them?